JUST when you thought reality TV couldn’t get any worse, A US production is holding auditions for an upcoming ‘social media’ reality show. IT WAS only a matter of time – Hollywood has come for the internet. 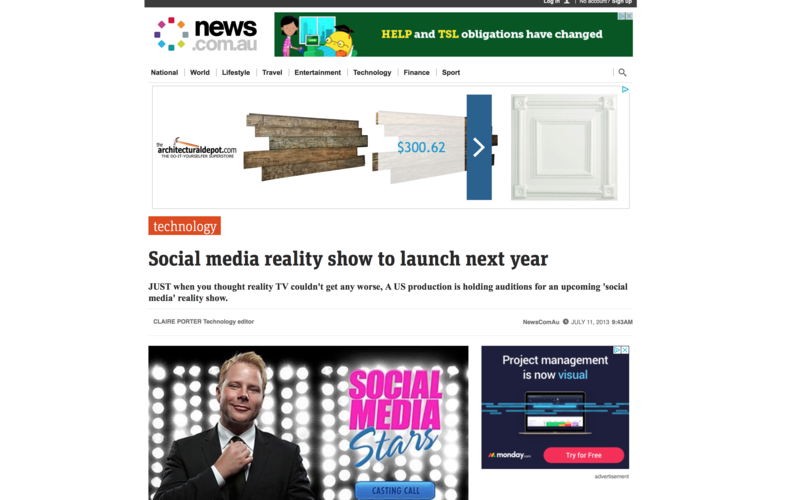 US production company, LaVoie Entertainment is launching a reality show based on social media. Casting calls for the show, called Social Media Stars, were sent out this week, and auditions are open to people from around the world, including Australia. “Social Media Stars Reality Show is looking for YOU!,” read the ad. Once auditions have been held, the producers will select five contestants to spend seven days on Miami Beach, living it up, and participating in social media challenges in order to prove that they have what it takes to be a social media star. So how exactly do they plan to make social media interesting? You’d be forgiven for picturing a bunch of internet celebrities staring gormlessly at their phones. Creator and executive producer Chris Lavoie told news.com.au that they plan to keep things moving by putting contestants through a series of challenges. In truth, Lavoie probably won’t struggle to make the show entertaining. Anyone with a passing interest in social media will know that people tend to overreact online in a big bad way. Case in point: Alec Baldwin, Charlie Sheen, Amanda Bynes, Kanye West, Russell Crowe,. Lindsay Lohan, and Chris Brown. But what happens when social media and TV cameras collide? Well according to Lavoie “there will be drama”. “I want gossip, controversy,” he said. “Because it’s a competition there will be drama, arguments. He may not want to play it safe, but how does Lavoie plan on keeping contestants safe from online hate? “It’s something that I do want to address in the show,” Lavoie said. Lavoie says he wanted to maintain “a certain level of class”. “No one will be throwing bottles at anyone,” he said. So what exactly does it take to be a Social Media Star? Well, according to the show’s creator, you kind of need to be a little bit internet famous, or at least have a large social media following. However, Lavoie said he couldn’t commit entirely to rule eight. “I did use the word ‘try’ for number eight,” he said. The first season of the show will air online on video sites such as YouTube, Vimeo and on the program’s official website. The ultimate success of the show however will be if it is picked up for TV – proving just how influential social networks and the internet can be. Social Media Stars will air online in September 2014.